The Madame in Black (Sverta Madam in it's native Swedish) comes from indie filmmaker Jarno Lee Vinsencius who produced, wrote, directed, as well as did the cinematography. This 24 minute horror short is based on a true urban legend from Sweden, one that people from other parts of the world will see shares many similarities with the Bloody Mary urban legend. Wow, I was not expecting how competent and well made The Madame in Black was going to be. Immediately the quality of the camera work stood out to me, this may be an indie film but you wouldn't know it to look at it. The camera work shines throughout, especially with the use of light and shadow that help create the tense atmosphere. Also impressive was the acting on show, now this is in Swedish with English subtitles (more on that later) but I still got a sense the characters, especially of Alex and Emma were being played by good actors who really suited their roles well. It is another example to prove that indie films needn't suffer bad acting. The most important factor that led to my enjoyment of The Madame in Black is that it was actually legitimately scary. I watched the majority of the film (wearing headphones) while sat at my friends kitchen table with her watching a music video channel, and her child watching a YouTube video in the background, yet despite the distraction I still found this affective. This is the result of two different factors. First of all the score fits the mood perfectly, it creates scares by rising to a crescendo in perfect marriage to what is happening on the screen. The second key factor is the titular madame in black (played by Ellinor Rosander) who is a unsettling antagonist. The film has a habit of showing the woman and then fast cutting to a different shot so that you don't quite get to see what she is doing. The purposeful stride she has made her seem pretty terrifying and stood out from the usual vogue of having what is essentially a teleporting static spirit. There are some great edits here, I especially loved the ending that gives a red herring in the form of the very typical jump scare that all horror shorts seem destined to end on, but then going into something brilliant. Now unfortunately this is not total perfection. First off I had real trouble with the subtitles that at times had very bad to read translations that almost ruined some scenes. I had to try and translate them in my head to make what I was reading make any sense. Also on a couple of occasions characters say lines but there were not any subtitles to show what was said. The other problem I had at times was the flow of the short, scenes seemed at times a bit disjointed with it hard to follow just what was going on, such as someone standing by an open door, then next scene them being dragged kicking and screaming through woodland with no transition to show how they came to be in that situation. Later this can be excused by a series of what could be dream sequences but earlier on there isn't that excuse. 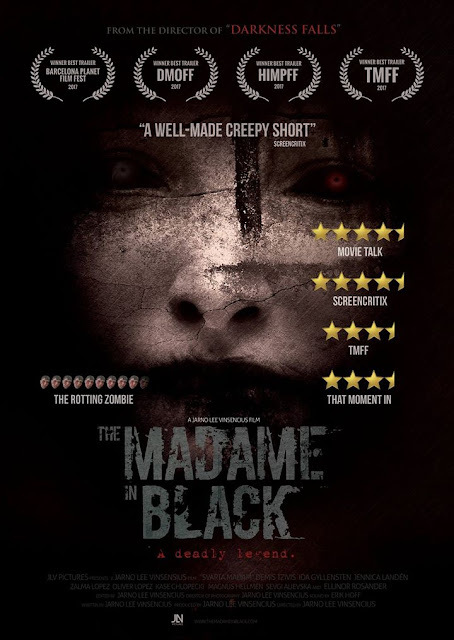 A much longer review than I intended but then The Madame in Black did impress me. Despite not being very original in terms of the actual story this is just so well crafted. More importantly it actually succeeds as a horror which is sadly a novel thing nowadays.